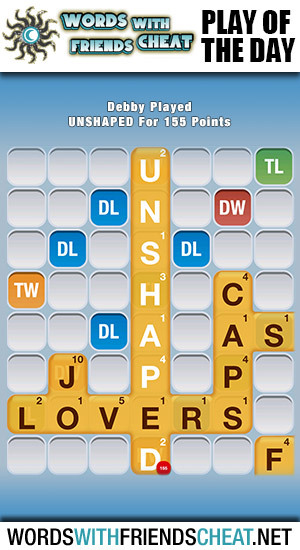 Today’s Words With Friends – Play Of The Day is UNSHAPED (155pts) and was submitted by Words With Friends Cheat user Debby. Contrary to the title’s suggestion, this play was well shaped and executed with great precision. Using the double word, triple word, and triple letter tiles, Debby unleashed a powerful play that most certainly resulted in a blow to her opponents strategical confidence. 1. Not shaped or definitely formed.